Celebrating his tenth anniversary of showing at Paris Fashion Week, Manish Arora presented ‘Cosmic Love’ which was a visual interplay of colours, styles, intricate silhouettes and designs. Taking the audience on a fast-paced fashion journey from Tribal Africa to Art Deco, the designer created geometrics with patchwork and embroidery. A variety of fabrics rocketed onto the ramp with denim, organza, boiled wool, raw plastic, velvet, twill, crêpe and Dupion setting the stage for the outfits. Detailing has always been Manish’s fortè, as he unleashed stunning velvet appliqués and optical illusion peacock embellishments in gleaming gold and green. Swarovski crystals looked magnificent for paisleys that were emblazoned on Burgundy, tunic dresses and velvet gowns. Colours played a celestial symphony as mustard, tangerine, midnight blue, violet, fuchsia and royal blue turned into the foundation for the collection. The Huemn Project presentation ‘Reflection’, urged us, as consumers of fashion, to upscale, recycle and strip down our fashion trace. With fashion being the world’s second biggest pollutive industry, after oil, the presentation depicted models as the human race perishing in a world of our making. The collection featured clothes made of recycled garments, all sourced from cut-away waste and transformed into a deep, wearable consciousness. The designs ranged from patchwork jackets and trousers to shirts and dresses in a variety of captivating patterns and colours. To break myths about plus-size fashion where colour, style and fabrics were concerned, Wendell Rodricks presented the ‘aLL PRIMERO’ collection. Making fashion democratic and inclusive, Wendell Rodricks and Schulen Fernandes created a line that flattered men and women with great curves and varying body types. Veronica Campabell, India’s first transgender plus size model, opened the show, followed by 20 others. The collection broke norms with a vivid palette, formerly considered a sartorial taboo for plus-size people. Womenswear included fluid creations like layered tunics, asymmetric gowns, swinging dresses, capes and kaftans that floated beautifully down the ramp. 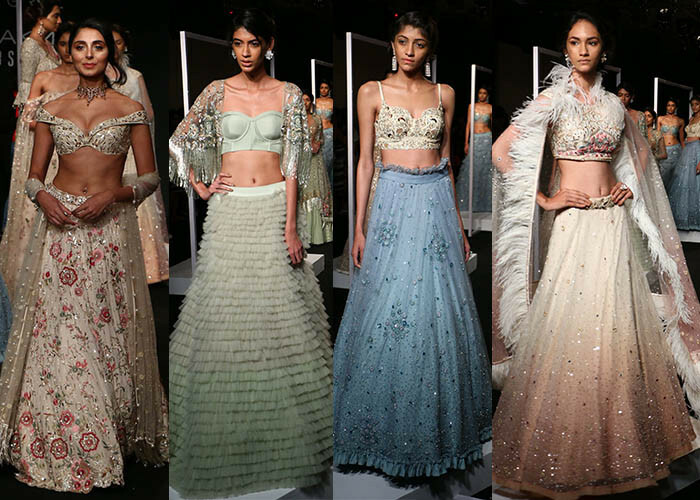 Showcasing his bridal collection for the first time, Nachiket Barve embodied the sheer timeless beauty of Greco-Roman Goddesses, such as Aphrodite, Hera, Gaia, Artemis and Athena. The designer worked with Greek drapes like toga and then brought in panelled skirts, bias cuts and capes. The colour palette began with deep indigo, burgundy, black and moved to Paprika, mustard, splashes of gold, bronze and pewter. The show was a symphony of luxurious lehengas, cholis with cold shoulders and long trailing capes, cowled pants, gowns and dramatic two-toned loose pants. There was an intelligent mix of the olive branch, Juno’s peacock, gilded Greco Roman wreaths, sprays of apple blossoms and Greek letters interspersed into the collection. The designer duo put together a line that was exquisitely feminine, yet experimental. Georgette, tulle, organza, satin and crepe were the fabrics chosen to construct this mystical labour of love. The collection had all the elements of a perfect fairy tale such as delicate embroidery and vintage style. The silhouettes were an ode to the Victorian era. A contemporary twist was given to the ballroom skirts, pairing them with well-tailored corsets, cholis, cropped tops with elongated sleeves and capes with maribou feather and fringes. Salmon pink, colonial blue, Edwardian vanilla and Jade were the hues chosen to tell this story. An iconic collection that was authentic and rich in heritage, Manoj Agarwal‘s bridal line was inspired by royal architecture as an artistic homage to historical monuments. Raw silk and tulle were tastefully used to construct the ambitious ethnic attires. Subtle embroidery motifs in pastel hues appeared on a palette of crimson, ink blue and brown along with a touch of stark red for an elevated touch. Known for her new-age fashion aesthetics and refreshing takes on conventional norms, Shreeya Somaiya‘s eponymous label developed a highly ambitious collection inspired by Carine Roitfeld’s CR Fashion book on Marie Antoinette. The designer contemporized that bold style using organza, chiffon, and denim. Pearl and crystals were incorporated for tactile textures. The silhouettes had a wide range including Duchess satin slip dresses, asymmetric skirts, jackets and shift dresses in soft pink and scarlet with ruffle detailing. Inspired by the way monks dress up, Divyam Mehta’s menswear started with fluid kurtas and loose trousers, coats, cropped/crushed shirts and dhoti pants. The low buttoned double-breasted jacket with draped baggy pants was an interesting addition. Cowled waistcoats, sherwanis with shawls and the black and white poncho with a low-crotch pleated pant further confirmed the theme of the show. He took things up a notch with womenswear with draped front-tied skirts and coats, asymmetric layered dresses, kimono covers and an interestingly draped sari. Ujjawal’s construction and design techniques have revolutionised the concept of menswear and womenswear. This time, while staying loyal to black and charcoal grey, he introduced pops of lavender, dark burgundy, air force blue and cadet grey in his collection. Men’s garments had the characteristic asymmetric silhouettes for waistcoats and kurtas while women’s garments had a feminine touch with stark shapes. Asymmetrical, double-breasted coats and dresses with machine embroidery, jumpsuits with side pockets, double-breasted dresses with soft backless coats made this one an all inclusive collection. Sonam and Paras Modi brought the naturally beautiful landscapes of Kashmir on the runway with the backdrop of Naseem Bagh. Motifs of the region such as the Chinar Tree, twines, floral vines and birds dominated the garments. Sheers, velvets and silks with intricate motifs of Himalayan bulbul translated onto outfits with elaborate hand embroidery techniques and bespoke prints. Embroidered belts and bespoke shoes further accentuated the contemporary silhouettes while retaining the spirit of Kashmir. The sorbet queen drew inspiration from the beautiful princess of Hyderabad, Niloufer. Themed around royal opulence, intricate hand embroidery took strong influences from details ranging from architecture to jewellery. Easy to wear silhouettes with separates touched upon every occasion leading up to the wedding day. The colour palette started off with peachy pinks going into burnt oranges to sunset yellows and then golds. Fabrics like pure hand weaved ahimsa silk, organza and pure organic mal mal breathed life into the garments. The label’s classic florals in watercolour hues were also spotted. This season, the designer also showcased a menswear line which focussed on understated elegance for the modern man with rich hand woven fabrics, intensive handmade detailing and subtle embellishments. The designer took inspiration from ancient warriors with metal punk and put his own signature spin to it. Aimed to exude strength and courage, he worked with leather and denim and added edgy details to the garment with metal work featuring chains, spikes and fringes. Sharp cuts and clever embroidery ran through the collection which comprised of leather waist coats, corsets, beaded fringed mini skirts, and moulded corset dresses with conical shoulders. Abhishek Paatni’s street style line gave us some major comfort-dressing goals. On offer were utilitarian and fun designs in suede, polyester mesh, French terry, jersey, cotton and parachute in vibrant colours. Longline tees, hoodies, sweat shirts and bombers added to the laid back, fuss free vibe. What stood out were the masculine details like the zippered long-sleeved numbers accentuated with parachute yokes and sweat shirts with zip pockets and drawstring hem lines. Ajay Kumar presented a line up of colourful graphic garments in natural fabrics. The peacock print trench coat with a white kurta was a departure from all things bright and a standout piece for those who veer away from OTT. Blouses, blazers, blousons, maxis and jackets in vibrant prints and the kaleidoscopic long-sleeved tunic ended the show on a high note.